When someone builds a world-class racing track near your house, and uses it to host one of the premier racing events on the planet, it would be churlish to ignore this, right? So while it's been a few years since we really followed F1 racing, we bought tickets and set about anticipating this racing weekend. Of course we were there to see the Formula 1 racing, which is cool in itself, and those cars ran each of the three days, with practise on Friday, more practise on Saturday morning, Qualifying on Saturday afternoon and the race on Sunday. There were other cars present however, which is just as well or things would have been very quiet at times. We had the Ferrari Challenge, in which a brace of Ferraris raced each other. There was the Pirelli GT3 series, featuring 30 Porsche 911 GT3 Cup cars. And there was the Historic Grand Prix, featuring GP cars from 1966 to 1983 when they ran 3-litre engines. This was very cool to see; there were a lot of different designs of car and many of them were familiar to me from watching F1 as a kid. They say that on Friday there were 65,000 people in attendance, about 85,000 on Saturday and 117,426 on Sunday. That's a lot of people, and this is a brand new race track with brand new infrastructure, a lot of which hadn't quite been finished yet. Overall, I think the Circuit of the Americas has a lot to be proud of, but here's an in-depth look at the venue from this weekend. We live about 25 minutes south of the racetrack, which is about three miles from Austin Bergstrom airport, across the SH130 toll road. We had to drive another ten minutes north on SH130 to get to the parking at Travis County Expo Centre. All the Circuit of the Americas (COTA) traffic was being routed there, and people ferried to the circuit on a huge fleet of buses. Unless, of course, you wanted to pay $200 for a parking pass, to bring your car to the circuit. We heard they had hired 530 buses for the event! On Friday, there were coaches from every corner of Texas and beyond, while over the weekend they had a vast array of school buses, including a number from Bastrop and Dallas. The buses were loaded in a quick and efficient manner, and we hardly had to wait at all. All you could see on SH130 was a constant stream of buses; a lot of them were coming from the other pickup point downtown, too. Even on Sunday leaving the circuit after the race, the service was good. They would load ten buses at once, then that batch would drive off and the next batch move into place. Very good service. However, I think we got off lightly - we were amongst the first wave of people to leave the track. This report from the Austin Statesman says that some folks lined up for an hour to get on the buses. The organizers had obviously anticipated this and had constructed an entertainment stage near the buses for bands to play while people waited! Once at the bus drop-off, it was actually a mile walk - maybe more - to the circuit entrance. This was a bit unexpected! There was a wide gravel pedestrian path up to the main gates. This was bordered by unfinished landscaping - a lot of earth banks were covered in mesh netting that of course were getting ripped up by people taking short cuts. There were also golf carts running up and down - very slowly, since they were trying to avoid the people. They could really do with a separate fenced-off cart track here. While I'm thinking about landscaping, it's a good job we had such beautiful weather over the weekend. A lot of the venue remains as bare earth, although grass is trying to grow in some areas. Time and seasons will fix their landscaping issues, but it would have been an utter quagmire if it had rained. I realise COTA had to prioritize what they were able to get finished in time for this weekend; I'm sure the track will be lovely in due course. On reaching the main gate, you go through a line of ticket and bag checkers, this is all very quick and painless. They scan your ticket's bar code on the way in - if you leave the track, you have to get it scanned again if you want re-entry. There's a bunch of welcoming staff inside the gates, handing out maps and information. All the staff were very friendly and cheerful; they seemed happy to be there. The biggest gripe we had over the weekend was the food situation. The prices were very steep, for one thing. A 20oz bottle of water was $4, a litre for $7, a beer for $8 or $9. Not sure who sets the prices for these things, but Damn. This is Texas, where outdoor events usually have water freely available, or if you have to buy it then it's $1-$2 a bottle. Beers are usually $5-6. We are not used to this level of mark-up! Being vegan, our food choices were limited. We found some very tasty tofu tacos at Chi'Lantro food truck, but they were pretty small at $9 for two tacos. There were veggie burritos at one place for $12 which we devoured in three bites - not good value for money! Similar burritos might have been had from the Gyro place around the corner ($9), but the queue was a thousand miles long and we are not that patient. There were two Asian stands who had veggie Bahn Mi, but we never managed to get any, since one never seemed to be open, and the other had run out. The best deal for us were the Boomerang handheld pies; they had spinach and mushroom on Saturday and Thai veggie on Sunday. They were still $8 a pop but it's quick to serve pies, so the line was never long. You couldn't get much in the way of coffee though; only two places sold it and one of those seemed impromptu - good for that vendor in filling a need. The venue seemed to be plagued with food problems in one way or another. I believe they had connectivity problems on Friday and Saturday; it wasn't until Sunday that I saw anyone taking credit cards. The Statesman link above tells of some folks running out of beer! We couldn't get bottled water first thing on Sunday from some vendors, who hadn't been restocked. There just weren't enough food vendors at some points round the track - lines from 11am to 2pm were insane, even on Friday. The catering was managed by Sodexo, a company who specialises in large event management, so I don't know if it was them or the venue or a combination of little problems, but they have some things to sort out for the next race. Austin is swarming with food trucks - they should get a few more in and dot them around the whole venue. Food wasn't the only expensive stuff available for purchase - I couldn't believe the price of the F1 team merchandise! $55 for a baseball hat, $50-80 for a T-shirt, up to $250 for a 'proper' team shirt with all the logos on etc. And there were a lot of people wearing these things, probably 20-30% of the crowd. The COTA merchandise was much more reasonable; $30-35 for a T-shirt. The lines for their stands were very long though; I shall pay a visit to their online shop imminently and avoid the wait. However, at the other end of the eating process, I must commend COTA on their restroom arrangements! They must have hired every porta-potty in Texas. They were everywhere; all around the track, and thousands of them. They had them at each end of the bus drop-off and pickup points. They had lots of paper stocks, and hand-washing gel outside. I never had to wait to use one. They got that one Right. First off, I must express my delight at the policy COTA chose to use over the weekend, of allowing any and all stills camera gear inside the circuit, including long lenses. (Video is disallowed). They originally wanted to ban lenses longer than 10" in length, but a public outcry convinced them to change their minds. This was a Godsend! While my 400mm is actually smaller than 10", I spotted a good number of people sporting fixed 400-500mm lenses, and each of us needed equipment of that focal length in order to get even slightly close to the cars. Here's a map of the track showing the numbered turns (credit: COTA) with the sun positions during the day marked on by me. You can see that being on the south side looking north is favorable for photography, which is handy, since that's where the good corners are. A racing venue such as this is always going to present certain realities that make photography challenging, for the most part. The tall fences are there in front of you for a good reason; F1 and other motorsports have seen their fair share of wheels and other parts detaching themselves from cars. You don't want to be whacked in the head by a flying tyre. COTA uses a double fence. The main debris-deflector fence is pretty heavy duty; made of many pillars and strong mesh wire, with many horizontal support wires. If you could get up to this fence, you could shoot through it with a long lens - the depth of field will render the fence invisible. This is what a lot of the credentialed photographers were doing. However there is an outer fence, with a roadway in between. This outer fence is shorter and less sturdy but the 20-foot gap in between means you can't get close enough to really lose the fences if they are in your shot. And they're in your shot for most of the way around. A historic F1 racer going around turn 7, behind the fence. You can lose the fence with a slow shutter speed (1/100s) but you lose a lot of shots to motion blur - these cars are fast!. Bumping it up to 1/160 gives you more keepers, and more fence. Tall cars like this one run the risk of horizontal wires showing up, too. Here's a Ferrari Challenger going around turn 18, where it's (a) backlit and (b) almost impossible to avoid the fence posts. There are a few places you can go to get unobstructed shots. Turn 2 and 3 aren't bad; if you can get up onto the wheelchair ramp on the turn 2 stand, that gives a nice view down onto the track. The pedestrian bridge gives a good almost-overhead view but of course they want to keep traffic on here moving; it is a human swarm during the day, so you can't really stop on here. A McLaren around turn 2, where you can look down on the cars if you're lucky. I love the McLaren paint scheme; that chrome looks liquid. The pit straight and garage area are almost inaccessible (unless you have a LOT of money for a pit pass!) so forget trying to get any shots here. The best you can do is go to turn 1, up on top of the hill, where you can get a long view down the hill, but it's not great photographically unless you have 600mm or more, although you'll be dealing with heat haze at that length. It is one heck of a hill for the racers though; a good steep climb up to the corner. This is as close as you can get to the garages from a viewpoint overlooking the pit wall. Too many fences for any good shots into the track, however. Turns 6 and 7 offer one of the best spots. Here, the track rises a little in front of you, then dips down slightly, but the ground crowd-side continues rising. You can get the cars coming towards you here, before getting them 3/4 to sideways on as they go around the corner. A Force India F1 car at Turn 7. I like the Force India colours. There's similar potential at turn 10, although it's not as good. You can catch some coming out of turns 8 and 9 but they're a little far away. Lastly, the hairpin (turn 11) offers a mostly-unobstructed view; again you can see them head on, and then get their tails as they charge off down the straight. This is the busiest spot for General Admission folks such as ourselves; there is a large grassy bank here which gets completely filled with people and chairs. It's pretty cool to see so many folks wearing their team colours, and waving their countries' flags. If you watched the F1 race coverage at all, you might have seen a Scotland flag waving here; we were standing behind that for the first few laps. A wide shot, showing how many folks are here, and how far you are from the cars! There is potential to catch people stomping on their brakes at the hairpin. Looking down at the turn 15 grandstand, from the hairpin. It's a long way off! Looking down the long straight, which has a surprising amount of elevation change. The long straight from turn 11 to turn 12 does not offer many vantage points, most of the trackside is taken up with RV parking. You can get close near turn 12 and try to catch cars as they pass you at around 200mph. This is as good as I got, at 1/400s! I think this Ferrari was around turn 14, from the gap in between the grandstands. Alan did investigate the Paddock Pass tickets, for a laugh. A mere $5000/person gets you into the paddock, with a free programme and set of earplugs. OK, then, moving on... Again, I am not sure if it is COTA, F1 or Bernie Ecclestone himself that sets the prices of these things. I suppose it's no surprise that the upper echelon tickets are marketed towards corporate buyers. The one other location that would make decent photos is from the top of the observation tower. They were charging $35/person to go up the 251ft tall tower in the centre of the circuit. I don't know how long you are allowed to stay up there, but it's a very strikingly-designed piece of architecture, and the pictures I have seen from up there look great. Another $70 for the pair of us to go up there wasn't really going to happen, however. Where do you draw the line on spending money? The tower dominates the track, as seen here from the hairpin (turn 11). A close up of the viewing gallery at the top. COTA is hosting some other world series races in early 2013 whose tickets are easily half the price of the F1 tickets - Moto GP and Australian V8 Supercars, to name but two. I also notice that the track is being split for the V8s; they're using the smaller club circuit. Both events have a lot more GA admissions; I don't know if they are removing some of the scaffolding/bleacher seating for these events, in which case a lot of the photography could be improved, if we don't have big stands in the way. Time will tell, I guess. This wouldn't be an aviation blog without a few aircraft, would it? And there were plenty in the skies over COTA. Dominating the airspace were the helicopters, mostly bringing people in from nearby airports and from temporary heliports downtown. They mostly stayed to the south of the track and as such were far away and backlit; not very photogenic, but sometimes one strayed close enough for a decent shot, especially at the hairpin end. The one helicopter that we did see a whole lot of was the camera ship for the F1 races. This pilot was very skilled. All those long, swooping shots that you see on TV, chasing cars down the long straights, they all come from this guy. He is doing lots of long, swoopy flying to get you those shots; it's impressive stuff. Spot the camera on the nose, and what I assume is a transmitter on the skid. Looking inside, you can see the cameraman is intent on his large screen in front of him. Meanwhile, other aircraft were out to play... here's the Environmental Protection Agency doing air quality checks. They flew a pattern across the whole track area avery day. The local police helicopter, possibly providing extra camera coverage. Last but certainly not least, we enjoyed a flyby before the F1 race, consisting of an F-16, P-38 and two P-51s. I believe they all came up from San Antonio; certainly the P-38 'Glacier Girl' is based there but I am not quite sure which P-51s we have here. I suspect the F-16 was from the Air National Guard at Lackland. And there you have it! Many kudos to COTA; it was a fun and impressive weekend. Roll on the next race. 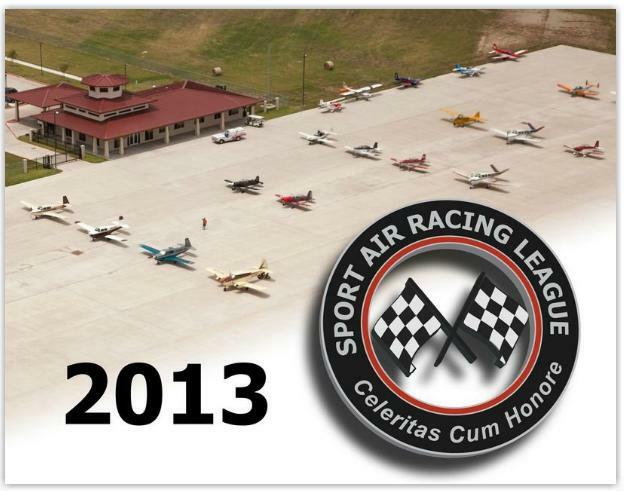 I made these shiny Calendars for the Sport Air Racing League. Come and get 'em! Splendid photos of twelve racing planes! All the race dates for the 2013 season, and as a free bonus, you get the rest of the year's days too! Once these stocks are gone, you can buy them direct from this page on Lulu.com. Friend Doug built himself a Vans RV-6. He spent about two and a half years building it, and got it flying in December 2011. Since then, he's flown all his test hours (40 of them) in order to prove the aeroplane, and flown lots more; because, well, he has a RV-6, and who wouldn't fly the pants off their RV if they had one? Recently, he delighted me by asking if I'd like to join him on a flight. So we went off to San Marcos and I acquainted myself with his aeroplane. It is very nice, containing a completely glass panel fitted with Grand Rapids instruments. We flew out past Lockhart to the practise area south and east of San Marcos, which is fairly quiet airspace with few airfields. Doug gave me control of the plane, and I got a feel for the way it flies. This airplane loves to climb! I've been lucky enough to fly a few different RVs and they are all sensitive on the controls; this one is no exception. It will run away with you as soon as you're not paying attention. So even though this was a beautiful, clear, calm day as only Central Texas can provide in the fall, I did spend a short while chasing the plane all over the sky until I got a handle on it. After I got it sorted, we were flying straight and level, and Doug suggested I try some turns. Around we went, in 90-degree increments, left and right. Then I tried doing a complete 360-degree turn, and to my extreme satisfaction, we felt a bump on resuming our initial heading - we had flown through our own wake :-) I always wanted to do that! We tried some slow flight; Doug had me reduce the throttle down to about 15 inches and the plane slowed to around 90 knots. The controls get very mushy at the slower speeds (cruise is more like 180 knots) and turns happen a lot quicker, it feels like you're turning on a dime (a sixpence, for our UK readers!). Back to San Marcos we flew, and I was very happy. Apparently I didn't disgrace myself too badly either, as Doug has taken me up twice since then! On our second flight, I was getting to know the electronic display a little better. Doug reckons it takes a good ten hours of flight to really get going with it - at first, it is a sea of numbers and moving arrows. It still is, to some extent, but the heading, airspeed, vertical speed indicator, altitude and artificial horizon are all obvious enough. There are other indicators and reference points that pop up now and again, especially when the autopilot gets involved. The little circle just left of centre on the main panel seen here is an indicator to show you where you're going at that moment in time. You can probably just make out on the left hand panel that it shows fuel levels, manifold pressure, engine RPM, cylinder head temperatures etc. It can show all kinds of other things too, but that screen is usually visible. Before wet set off on our second flight, Doug took me through the whole flight planning process; deciding on where you want to go, then using a whiz wheel and chart to calculate the heading to fly, compensated for magnetic deviation and wind, and for how long to fly before you reach your destination, how much fuel burn you will use etc. This was very cool as I've not had this stuff explained to me before. We thought that we should reach Gonzales 15 minutes after we took off. The timer was started as we entered the runway, and 13.5 minutes later we crossed Gonzales airport - we'd had a slight tailwind which we didn't account for. Here's San Marcos from the air. Yesterday, Doug texted me and asked if I'd like to join him for a jaunt up to Georgetown for some cheap fuel. Avgas (100LL) is currently about $5.60/gal in San Marcos, and $4.50/gal in Georgetown. I am always amazed at the huge variation in avgas prices; if you go to Bergstrom you can pay $8/gal. So off we set to the north, flew over our neighbourhood - always fun! - and got a nice view of Austin as we passed by, although it was a little far away for the lens I was using to make a decent picture. After fueling up, we flew towards Taylor. Doug had made mention of doing a touch-and-go there but there was some random traffic floating around the area, so we hung back. Doug had me make a bit of an approach there; at least turning towards the runway a couple of miles out, before we turned away and headed south again. Doug asked the controllers at Austin Bergstrom if we might be allowed into their airspace, to have a look at the Circuit of the Americas, which is where the Formula 1 race is being held this weekend. They have spent the last two years building this track and it looks pretty awesome. We have tickets to the F1 race, so watch this space for reports! Anyway, the track is very close to the approach into runway 35R at Bergstrom, just across the other side of the 130 toll road. So you don't want to be getting in the way of commercial jet traffic. The controllers were very accommodating however and let us make an orbit around the track to get some photos. I wonder how many planes have been doing the same thing; I know for a fact we're not the only ones! So that was sweet; getting a look at the circuit from on high. They have painted a bunch of red white and blue stars all over the sides of the circuit, it looks all shiny and new. I hope those of you watching the F1 race on TV get a good look at it all! Watch for Alan and me waving; maybe you'll see us in the grassy area at the end of the hairpin. Meanwhile, I will let Doug's lessons sink in. He has been very generous with his time and airplane. Thanks, Doug!